This topic contains 11 replies, has 5 voices, and was last updated by Zach Matthews Apr 16, 2017 at 5:08 pm. Dock light fishing is not for everyone. It’s cold many nights in winter, conditions motoring around the lake are sketchy, and some landowners are friendly while others will shoot at you. That being said the dock lights of area lakes are probably the best wintertime fishery on the fly anywhere in Georgia. If this post encourages one person who owns a dock to purchase a Green Monster or similar dock light, it will be worth it. These things really are fascinating. If you are curious about how these things work and how best to deploy them, feel free to shoot me an email – ZachMatthews@gmail.com. When I started doing this three or four years ago I briefly tried to hang my own lights. That’s less likely to be effective than simply finding some spots where lights are left on for decorative purposes. Around the area’s lakes, more and more landowners are buying these both to improve their fishing and to spice up the look of their increasingly fancy lake houses. We have had our best success with black patterns, both large and small. It pays to eyeball the bait that happens to be on a given light and try to match the size. Lights with big huge swirls of bait on them are sometimes less productive than lights with less bait; the former tend to supply too much choice to the fish, just like a prolific mayfly hatch, so they are less likely to want to chase down your fly. (1) Extreme stealth. Wind is down at night, the lake is quiet, and the fish can hear you talking in that cold still water. Avoid all boat rocking, disable trolling motor beeping noises, play no music, slam no coolers, and keep your voices low. This also shows respect for the landowner who is trying to sleep a few yards away, thus making it less likely you’ll be run off. (2) The approach also needs to be stealthy. I’ve watched other boats motor in and put a blitz down. Drop the trolling motor 500 yards out and come in quietly. (3) Wear eye protection. Heavy nasty hooks flying around in the dark is no bueno. (4) Wear personal flotation in any smaller boat (jonboat or down). That lake is no place to be screwing around in the middle of the night. (5) Use a well-lighted boat. This is for safety. Red lights will preserve your night vision. (6) Fish the penumbra or the half-lit shadows on the edges of the light. Oftentimes this is the only way to get more than one fish off a light. If you put the fly over the light itself, you will likely catch one fish but the fight will be super obvious and all other fish will bail out. (7) If you hook a fish immediately get away from the light. Heavy tackle and tight drags help. The fish will attempt to wrap you up. (8) Most lights fish well for about 20 minutes and then it is time to move on. This is especially true with stripers. Double lights give you a chance to switch back and forth and lighten the pressure on both. (9) Finding green lights in a cove is easier with a camera that can take a long exposure. The green glow will be obvious on the picture even if it is out of focus. (10) You can sight fish to a spotted fish. A still striper is a happy striper. Cast past it in the dark on an angle that will bring your fly by its face, like feeding a carp or a hunting brown trout. 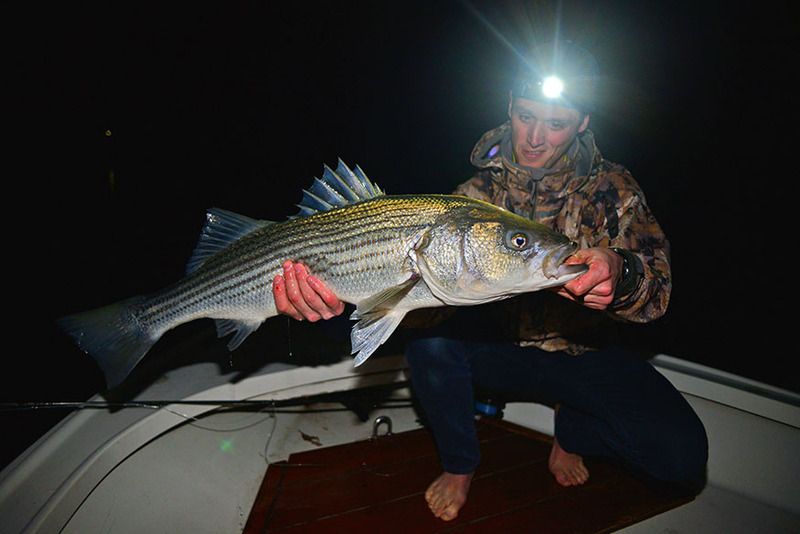 Conversely a striper that is darting around snatching bait has already likely been stirred up by another boat that came and left before you got there, or it simply is feeling pressured for its own reasons. Search for that fish in the dim water around the light, but stay off the main stage. (11) We are catching fish using both intermediate and fast sinking lines, as well as weighted and unweighted flies. There doesn’t seem to be a particular secret here. The best lights for big fish are those hanging over deep water near the mouth of a cove or creek, or in passes. I fish a deep sinking line here. This is where you see the true submarines, but these lights also tend to be turned off more often for whatever reason. (12) Bar lights will hold fish but aren’t worth as much time as a true Green Monster. If you buy one for God’s sake do not put it directly under your dock. First of all it looks bad, secondly any fish you might catch off it yourself is going to get all tangled in the dock gear, and finally the lights 20 feet or so off the end of the dock have a lot more chance to attract a nice bait tornado. Also if you put a dock light under your dock people are still going to try to fish it, and that will mean lots of holes in your boat covers as they get snagged up and rip themselves free. A wide variety of fish species use the lights, and they come and go with different weather and temperature patterns. We’ve caught nice crappie, big largemouth bass, quality spotted (Kentucky) bass, stripers, and we’ve seen some stuff that looks suspiciously like walleye. If you see something that looks like a turtle just hanging out around the light, that’s a crappie turning sideways for whatever reason. 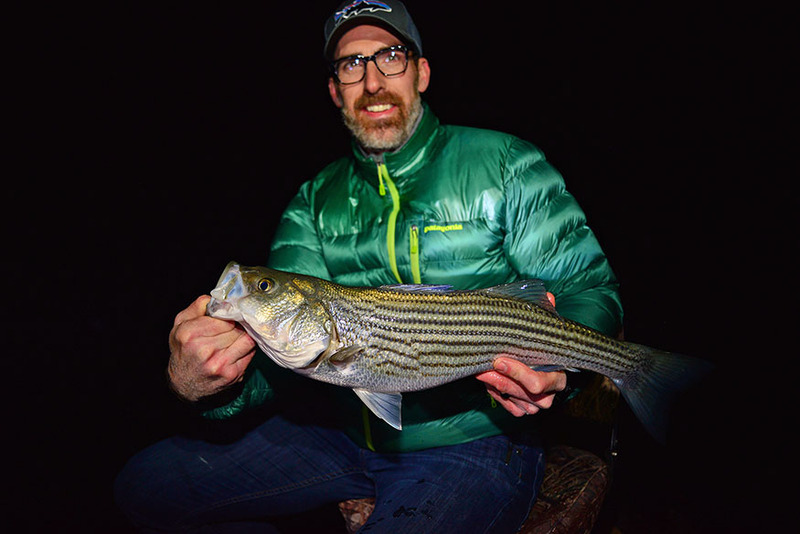 You’ll learn to differentiate largemouth and spotted bass from stripers both by their squarish build (not always obvious when lensed through the water from a distance) but also by their tails, which are shorter and closer to their bodies. 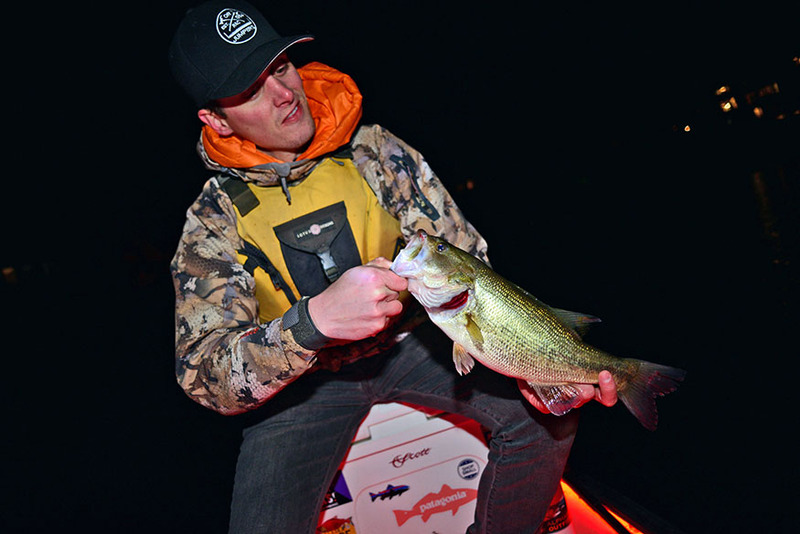 Spots and largemouth tend to hold on the corners of the docks themselves. Stripers cruise in and out of open water. Largemouth sip flies and a big largemouth can have a deceptively light take. Striper takes are unmistakable. They feel like a person yanked on the line. GREAT post. Really appreciate the intel. Now just got to work up the guts to do it. That is an example of a light with a lot of bait on it — indeed possibly too much. Those are tons of fun to see and you will likely catch a fish or two on it, but you’ll need to be a little more crafty about working the edges and using a strip-strip-settle retrieve. You can pretty much count on the fish being stuffed unless they are new arrivals. These lights are worth returning to later in the evening though, as sometimes these baitballs will get smashed to bits and the fish will still be looking for more. I used cheap LED light strips to fit out the Gheenoe with safety lights. They work great and apply just like tape. I recommend getting some of the clip connectors to attach to the ends of the tape – they are stronger than soldering. That Amazon page has the clips in the frequently bought together column. Waterproof LED strips have a layer of soft plastic, like a swimbait, to protect them. You can cut that with a sharp knife and easily scrape it off to expose the connection point. There’s a new connector every foot or so, so if you screw up you have more options. This tape had gotten unbelievably cheap – $8 for 16 feet or $0.50 per foot. Henry guides for stripers in this area and probably knows more about dock light fishing on the fly than anyone. I’ve fished with him — excellent guide, who I would strongly recommend. Um, yeah. I’m interested. Good stuff right there Zach. I’m just south of Chattanooga and usually fish Chickamauga and Nickajack. I’m sure some of those Green Monster lights are out there. 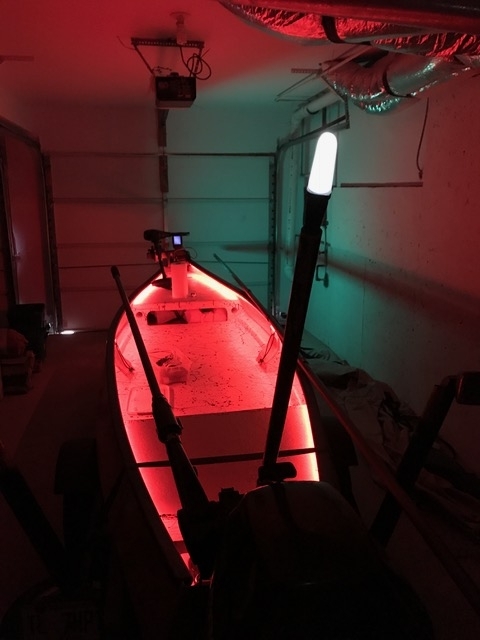 Don’t fish much at night and need to get my Riverhawk rigged with lights. Appreciate the info on those LED strips. Those look great. I assume fairly durable? Yes, so far they have been really strong. The strips come basically on a printed circuit board. You can see the copper wire pressed into the stripping. The waterproofing layer protects the hardware and the lights. I just cleaned underneath my rub rails very thoroughly and applied them carefully just like a sticker. They are bright but not too bright. I have the same type of system for the red/green bow lights, pressed onto the outside of the rub rails, but those are of a brighter grade. They are really freaking bright. The real challenge with Gheenoes and similar boats with narrow transoms is getting your white safety light mounted in the rear in such a way that you won’t knock it off by turning the motor. I solved that problem by drilling a hole through a 3/4″ PVC fitting and mounting it to the center hand grip of my outboard with a strong zip tie. Everything is black on black and I padded the outboard with a little tape first. 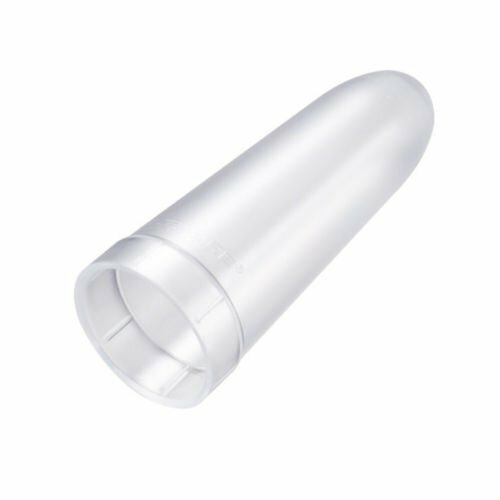 Then I have another length of about 2 feet of 3/4″ PVC pipe (also black), that I can stick down in there to make an elevated point. The light itself is a AA flashlight, MagLite style, which has a dome tip I bought off Amazon on it. I wrapped it in electrical tape in two places to make bumpers to make it snug in the pipe. 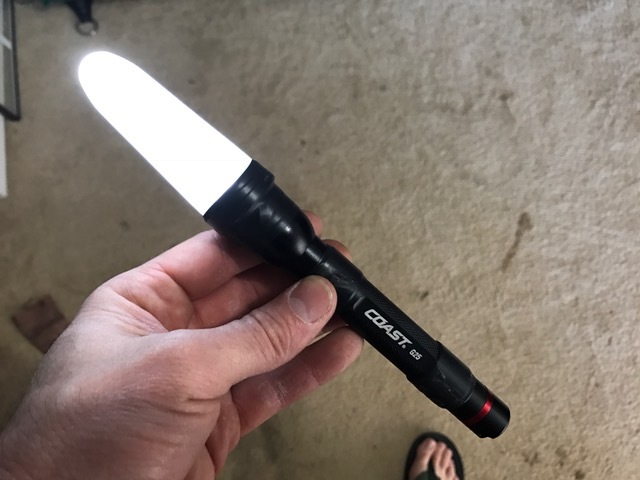 I recently upgraded to a bright LED mini maglight that happened to be the right size. I do recommend securing the dome with a turn of electrical tape as I have had them fly off. Thus as of now the only power my boat needs all comes from a single marine battery (which feeds the trolling motor, the depthfinder you see at the front, and all the lights) except for the rear white light which runs on two AA batteries. I did a kill test to see how much drainage I would have. The lights alone only draw my battery down 75% over six hours, so they would effectively go all night. If you use the trolling motor on top of that a lot you can kill it in 3-4 hours of fishing but helpfully the first thing to go down is the depthfinder, so you know when you’re getting low. LEDs don’t draw much and they dim rather than die, so you can be in compliance and safe on your way back to the ramp. Gheenoes like mine really aren’t appropriate for permanent electronics, and I don’t want a trolling motor on the boat at all unless I have to have it. So I built my trolling motor mount to come off with the turn of two wingnuts, and it takes the depthfinder with it. That leaves the connection points for the lights tucked safely up in the nosecap for deer season and late night carp fishing return trips. One of my only regrets in how I designed my Gheenoe is that I failed to measure the front compartment so I could put the battery belowdecks. Thus I used a piece of grill thermal felt tape to make a rear bumper for the battery, which keeps it from sliding back on the deck when we are under power. When everything is on board it is a pretty compact front deck, and at night most of the time I have my anglers cast from the false floor in the middle of the boat, which is safer and less tippy. That also reduces boat rock. Nice read Zach. It is very similar to our winter dock fishing here in the Tampa area for snook and redfish. The only real difference I see is the attire. We just wear shorts and a shirt. Thanks again for the level of detail on this stuff Zach. I’ve had my Riverhawk for close to two years and plan to start customizing a bit now that I’ve fished from it enough to know what I want. I went back and looked at your old posts on modifying your Gheenoe as well. Very helpful. Bob have you gotten to do that snook fishing? This is actually a carbon copy of that fishery — you hit the nail right on the head. My understanding is that the Florida folks were the first ones to realize that if you left a naked high-temperature bulb exposed underwater, it would burn off the crud that otherwise grows on subsurface structures (as long as you used it regularly). The Green Monster is probably the most successful brand of these but they all work about the same. They have a strong, large bulb. I think they burn a halogen style filament but don’t quote me on that. You can see the cable gauge on these things there. Basically you attach the power supply to your dock with a solar element to that will turn it on and off automatically (which remember is an important maintenance feature). I think you can set it up so it isn’t turning on all night but rather just for a few hours, or so it only burns on weekends when you’ll be at your lake house, or whatever you like. Then you run the cable to your desired location and sink it with a heavy weight. The light itself actually floats off the bottom due to the air inside it. That means it can get snagged by anglers some times, which is why it’s important to have that strong cable. The advantages to having these lights are obvious: looks great, attracts fish, makes your whole dock area stay well-lit which improves safety. The disadvantage on a public lake is that people *are* going to fish your light. This is the same thing as putting out a fish feeder on a river; you are attracting the legal quarry to your location so you can expect law-abiding anglers to come with it. It’s not fair to expect to have your own private Idaho, and that means you need to exercise a little good judgment. 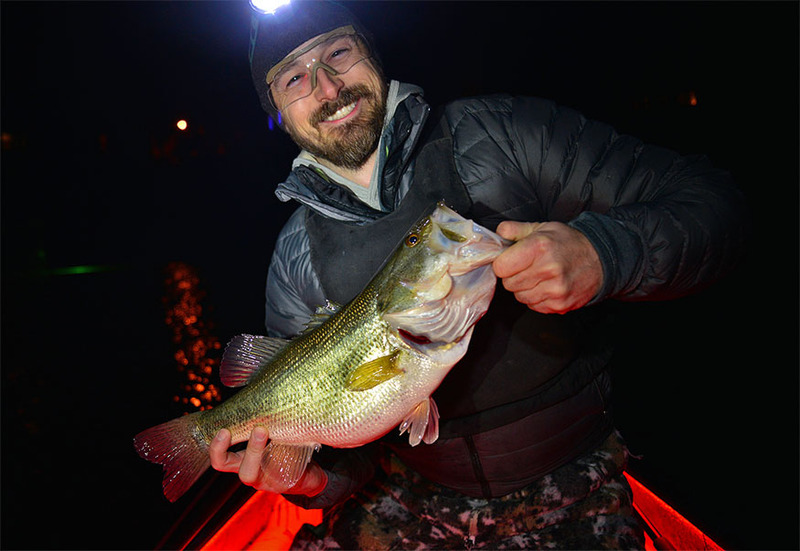 If you want these lights in a private setting I’d suggest putting one in a pond — it would be a complete blast to catch big largemouth that way. If you want to discourage anglers from fishing your light you can turn it off on weekends or when you won’t be around (or set it up so it only comes on from like 1- 4AM when most anglers are off the water during times you aren’t there to enjoy it yourself). But to me, the best thing you can do if you want to have a cool fishing light and enjoy it too is take it easy, remember the lake doesn’t belong to you, and encourage your neighbors to also get lights so that people don’t concentrate only on yours. These lights can get stirred up and return back to normal within 30 minutes. And in my experience all you need to do if you want the light to yourself is walk out on the dock and ask any anglers you see to give you an hour so you can fish it yourself before they come back. Most people are reasonable and will be happy to move on. There might be a handful of people crazy enough to fish in the dark nights of winter but there will never be a crowd. If you are the kind of person who lets other people visiting your spot get your blood pressure up, this isn’t for you. Zach, I see a fishfinder in that picture. Which one are you using. I’m planning to re-do my bow somewhat similar to your setup. Thanks. Bobby that’s a base model Garmin. As a fish finder it is beyond useless. But it is very useful as a depth finder, and also has a temperature gauge. That’s helpful info when counting down your flies because you don’t always know how deep the bottom is–a lot of times the lights are suspended several feel up, but other times they are laying on the mud.